The latest monthly climate summary for the Southeast is now available from the Southeast Regional Climate Center. It was the warmest February for the Southeast since records began in 1895. 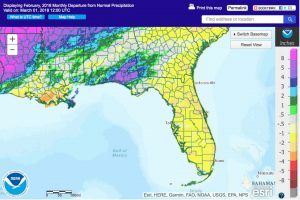 You can view the report at http://sercc.com/climateinfo_files/monthly/southeast_monthly_report/southeast201802.pdf. The latest monthly and seasonal climate summary for the US was released by NOAA today. 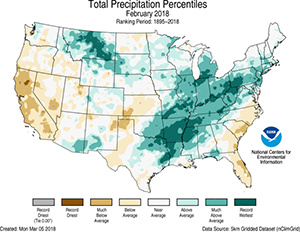 You can read about it at https://www.ncei.noaa.gov/news/national-climate-201802. During February, the average contiguous U.S. temperature was 35.4°F, 1.6°F above the 20th century average. This ranked among the warmest third of the 124-year period of record. 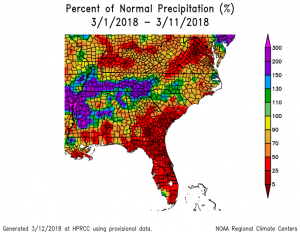 The February precipitation total for the contiguous U.S…. 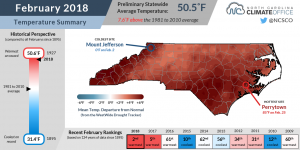 The latest monthly climate summary for North Carolina is now available. You can read it at http://climate.ncsu.edu/climateblog?id=255&h=5666e5c1. 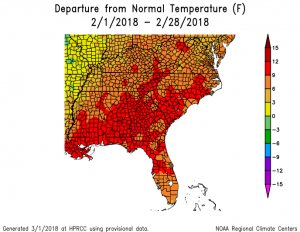 Every official weather station across the state of Georgia was at least nine degrees above normal in February 2018, leading to what will be a record warm month once the final statistics are tallied. Numerous high temperature records were broken this month in conjunction with the hottest conditions in mid-month….